Posted by Teresa Mihelic HelpDesk on Monday, March 4th, 2013 at 11:14am. 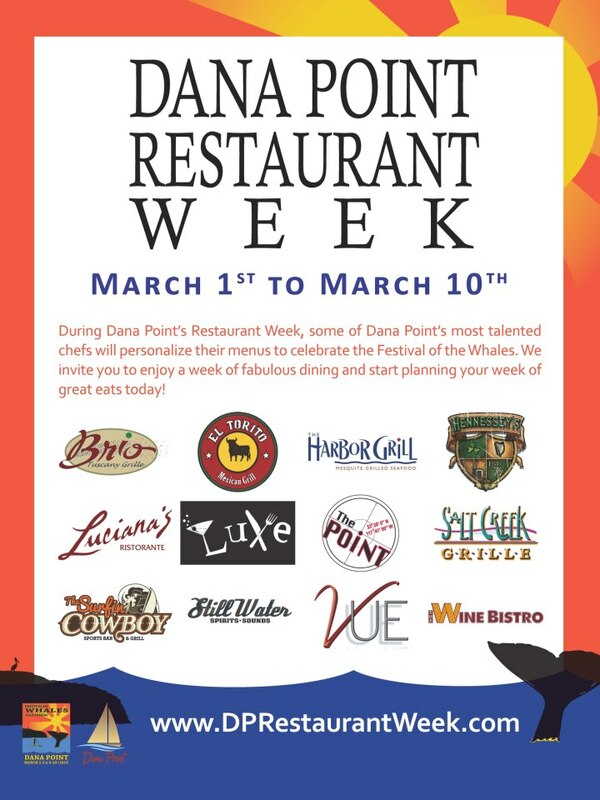 As part as the many festivities during the Festival of Whales in Dana Point going on right now ( March 2013), the Dana Point Restaurant Association is happy to present twelve participant restaurants in the Restaurant Week! During Dana Point’s Restaurant Week, some of Dana Point’s most talented chefs will personalize their menus to celebrate the Festival of the Whales. Whether you’re a local, or just visiting, Restaurant Week is the perfect time to try new places, enjoy a romantic dinner, or meet up with a group of friends to enjoy some great food in Dana Point! Remember most of these places are within walking distance from the many charming and coastal neighborhoods of Dana Point. Are you looking to buy or rent a place here? Let us know, we will be happy to help guide you.